Cancer Chemotherapy: Medical Outline Series discusses the benefits and risks of cancer chemotherapy. This book is composed of 11 chapters that cover the pharmacologic and therapeutic potentials of some chemotherapeutic agents. The opening chapter briefly considers the pharmacology of cancer chemotherapy. Considerable chapters are devoted to some cancer chemotherapeutic agents, including alkylating agents, methotrexate, 6-mercaptopurine, 5-fluorouracil, and Vinca rosea alkaloids. Each chapter examines the indications, dosage, toxicity, physiology, chemistry, and pharmacology of the agents. The final chapter covers the various tumors, and the agent or agents of choice for each tumor. 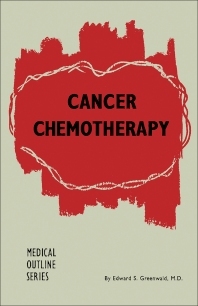 This book will prove useful to internists, surgeons, clinicians, and general practitioners who have had some formal training or supervised experience with chemotherapy.